For donors and development professionals at public stations, the process of converting a used car into a charitable donation that benefits their favorite pubcasting outlet is a painless, straightforward process. Both are spared the hassle of selling or disposing of Grandma’s 1990 Ford Taurus. The donor makes a phone call, arranges a pickup date, signs over the title and can receive a tax credit for the donation. The development director receives a payment — how much can depend on the value of the vehicle and the fee schedule of their preferred vehicle donation vendor. The limited maintenance needed to operate such programs involves little more than running on-air promotions inviting listeners to donate cars. 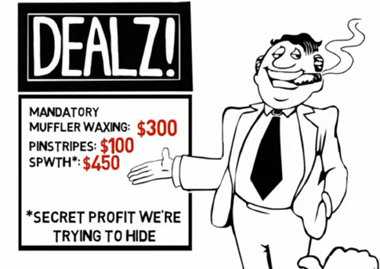 A still from a marketing video created by CarTalk Vehicle Donation Services. But the process that plays out from the donor’s first phone call to the check’s arrival at the station is opaque and can involve a number of for-profit and nonprofit companies that take 20 percent or more of the sale price in fees. These middlemen handle the complicated processes of selling cars and clearing titles, providing a valuable service to stations while competing against each other for their business. Two third-party vendors that have established partnerships with local pubcasters are Charitable Auto Resources Inc. and Vehicle Donation to Any Charity’s CarTalk Vehicle Donation Services. Both companies run their programs through central charities, which take legal ownership of the donated cars and receive a share of each sale. Executives of both companies acknowledge that the lack of transparency within the car donation industry has been a problem, and they have adopted practices that provide more disclosure. Other vendors courting public media stations include the Center for Car Donations LLC and Vehicles For Charity, a fundraising subsidiary of a Colorado nonprofit. With so many players competing for stations’ business, pubcasting development experts don’t know how much revenue vehicle donations generate systemwide. Michal Heiplik, director of the Contributor Development Partnership based at WGBH, estimates that total returns could be as much as $20 million annually. CDP, a fundraising cooperative backed by CPB and the Public Television Major Market Group, recently entered the field as a potential disruptor to the vendors now working with stations. The partnership unveiled a program that standardizes the fees paid to vendors, which can vary widely depending on the condition and sale value of the car, and frequently are not disclosed to donors or the station. The 18 stations participating in CDP’s program pay a flat fee for each vehicle prior to sale, regardless of its condition. At stake are millions in fees and proceeds to the vendors and the stations they work with. Public media is a latecomer to vehicle-donation fundraising, but the practice has spread exponentially during the past five years, according to station-based development officers and executives at vehicle donation programs. WAMU in Washington, D.C., raised a net $1 million annually from vehicle donations over the past four years, according to Walt Gillette, development director. The proceeds outpaced the $850,000 generated by WAMU’s workplace giving program in fiscal 2012. WAMU receives as many as 35 car donations each week, and they’re usually handled by CARS. Under its fee system, the station earns an average of $450 on each car, and the vendor charges fees up to 30 percent of a car’s gross sale value. There are exceptions and oddball situations, such as the recent donation of a 1939 Packard in mint condition that sold for $17,000. Smaller stations don’t have the same volume of donated cars as those in major markets, but the programs have become an important part of their fundraising efforts. Since introducing its car program five years ago, WCQS, in Asheville, N.C., now receives as many as three car donations each week. WCQS uses CARS as its primary vendor, according to Michelle Keenan, membership director, but it also accepts donations through V-DAC, which is associated with Car Talk. The volume of donations ebbs and flows based on the amount of airtime the station can commit to promotional spots. The increasing popularity of vehicle donation programs caught Heiplik’s attention as the Contributor Development Partnership studied how to help stations improve their fundraising results by adopting best practices. For many stations, vehicle donation programs provide only 1 to 1.5 percent of their total donations, according to CDP’s research. But the results varied widely: Top stations are earning around 7 percent of their donations from cars. And, in a shot fired at the established business model of processing the car sales through centralized charities and assessing varying fees, CDP negotiated a flat-rate deal with Insurance Auto Auctions Inc. About 18 stations, including Boston’s WGBH and Indianapolis’s WFYI, have signed on for the program that charges a flat $150, regardless of the condition of the donated vehicle, to handle the sale. IAA is a wholly owned subsidiary of KAR Auctions Services Inc. The Carmel, Ind.–based company reported a $29.1 million profit for the first quarter of 2013 that ended on March 31. According to Heiplik, this new approach could increase stations’ net return on each vehicle from 65 percent to 70 percent and to as much as 85 percent. Stations and donors should not notice a difference in service and marketing to donors under CDP’s program, Heiplik said, but there will be less marketing directed at the stations themselves. The simplicity of vehicle donation programs has been a bonus to station development professionals because they earn the revenue without adding staff or diverting scarce resources, Heiplik said. But by not scrutinizing how cars are converted to cash — and how the money is divided — they are losing money. Vendors such as CARS and V-DAC criticize CDP’s flat-fee approach as simplistic because it stifles creativity and limits options for how vehicles are sold. Both companies assess fees based on a car’s condition, how it is sold and the work needed to prepare it for sale. V-DAC has tried CDP’s approach of relying on auction houses to handle sales through an earlier relationship with IAA, according the Mark Jones, c.e.o. V-DAC and IAA decided to split ways in 2008 because his company wanted to offer customers more options for selling their cars. Additional options beyond auctions include selling vehicles to used car lots or other sellers with whom the vendor has a relationship. For popular models with a high resale value, the companies also turn to online services such as eBay to fetch a higher sale price. V-DAC has leveraged its relationship with Car Talk, one of public radio’s most popular weekend programs, to expand its service to broadcasters and their donors. The California-based company forged a partnership with the producers of Car Talk in 2004 to co-brand and market its donation program to stations, especially the radio outlets carrying the show. “The Car Talk brand wasn’t built accidentally — their level of integrity and straightforwardness is really what they’re all about,” Jones said. V-DAC saw the association with Car Talk as a way to align itself with those values and give it a competitive edge. Nevertheless, Jones said, it took a long time to get the program up and running properly. In V-DAC’s business model, ICA is the central charity that serves as the legal recipient of the donated cars. For this, ICA receives a 3.75 percent cut from the gross value of each car sale. The charity, which is comprised of member nonprofits, earned $34 million, according to its 2011 Form 990 filed with the Internal Revenue Service. ICA’s largest grant recipients that year included $1.43 million to the Correctional Peace Officers’ Foundation; $1.11 million for the American Society for the Prevention of Cruelty to Animals; and $652,955 to Catholic Relief Services. ICA also paid $295,737 to Minnesota Public Radio. But Jones acknowledges that vehicle donation companies haven’t been forthcoming about disclosing details of the transactions; V-DAC, he said, has tried to change that. As a way to improve its own disclosures V-DAC posts its fees on its website. In one example, a “recycler” car that fetches $125 in a salvage sale would return $53 net to the station; V-DAC would earn a $22 management fee. A “premium vehicle” that sells for $2,600 would generate $1,827 to the station and $609 for V-DAC. In both transactions, a portion of the sale proceeds covers towing, auction expenses and paperwork fees required by the various states’ departments of motor vehicles. CARS is one of the biggest vendors that V-DAC and public TV’s CDP compete against for public media vehicle donations. CARS, which operates as a for-profit vehicle donation company, is owned by Jewish Family Service of San Diego, a 501(c)(3) nonprofit. According to its tax records, Jewish Family Service brought in $18.8 million in revenue for the fiscal year ending June 30, 2012. The charity’s total expenses were $15.8 million for services that included geriatric care, counseling and a nonprofit adoption agency. Jewish Family Service also owns Charitable Adult Rides & Services, a nonprofit started in 2010 that acts as the central charity for the for-profit CARS, similar to V-DAC’s relationship with ICA. When CARS began business, it also sought to differentiate itself from disreputable firms that handled the transactions with little disclosure to the beneficiary charities. CARS launched a web portal to inform its client stations about the sale process, and it recently unveiled a new “cloud marketing” system that uses search engine optimization to increase donations, among other features. The various approaches for managing vehicle donations will be on display this week during DEI’s Public Media Development & Marketing Conference in Atlanta. CARS, CDP and the CarTalk Vehicle Donation Program are all sponsors of the conference, while Vehicles for Charity and the Center for Car Donations are planned exhibitors. Public media’s base of loyal audiences and engaged donors, and their demographic profile as highly educated and affluent, make the system an attractive market for vehicle donation firms. This article was first published in Current, July 8, 2013. San Diego–based Charitable Adult Rides and Services acquired the Center for Car Donations in July. All the organizations accept all types of cars and also the cars with repairs. But the cars which are very old are not accepted. If the cars have repairs, the charities which train the people in small works, make them repair the car and then use for their purpose or sell it to make money. Is that why Car Talk still gives out a phone number even though they are making no new shows and are just running repackaged “encore” shows as if they’re new programming? Integrity and straightforwardness, my Aunt Tilly.